-Arch- wrote: it uses Chromium Base ? @There's a Portable version at their site too. mightyglydd wrote: FWIW, Slimjet's rather addictive IMIO, it's a greyhound fast, (Vivaldi is a slug (here) in comparison) somewhat customizable, has some neat features and uses waaaaaay less memory than any other browser I'm trying. Works great on my Puppy Linux 'stick in wallet' OS's too. See if your distro has it. I got mine from the great Pup Forum, they have a some real human beings over there. It makes sense to change from Firefox, because of lack of customization with WebExtensions-only in v.57, to a browser that also only has Webextensions? Or I am missing something here? If all else is equal, SPEED becomes the deciding factor....doesn't it ? @Hey, I'm just trying stuff...."forewarned is forearmed:"
mightyglydd wrote: If all else is equal, SPEED becomes the deciding factor....doesn't it ? Not a likely candidate for your daily 'go to' browser though. I've got an old dillo_30p1.exe (Windows) if anyone wants. The SeaMonkey/Thunderbird one, although it's only just appeared in ghacks, is actually just a 'news round up' of old stuff, i.e. it's using a 15 month old Mozilla announcement and then a 5 month old T/bird discussion and finally a statement in a 2 month old SM status meeting. The link covers how 'Mozilla stated back then that it would support the Thunderbird team financially, with resources required for the separation, and with legal advice.' and how T/bird raised almost $180,000 in donations back last August or whatever...that sort of stuff. For those who prefer their news somewhat 'fresher', this type of thing is (and was) announced 'live' at the time in the Thunderbird and SeaMonkey General forums. As for the other 2 links, I'm probably not best suited to comment, as I do have a certain bias on that. Don't get me wrong, I genuinely applaud the effort and commitment that goes into doing things like that, it's just that over time you 'see things' and just know that I don't fancy using them. That doesn't mean other people shouldn't, of course. I do genuinely feel for the Cyberfox guy, lot of effort went into all that. But yeah, it's a tough game and the guy's decision to prioritise his own wellbeing over this browser stuff was the right one, I reckon. There is definetely something wrong with session restore right now because "Open all in tabs" works MUCH faster. I guess that's because background tabs are restored in the parent process instead of the content process. I hope this bug will improve session restore performance. Incidentally, like most Stickies on forums, the most relevant and interesting stuff is always in the first 2 or 3 pages and that's the case with this one. After that, people can either endlessly discuss the same old stuff over and over again or else just bring up other vaguely related stuff. Here, we're doing the latter. I think all I would add to the early stuff written is to point out that there might be the odd exception to the general position. For example, content changing legacy (means the existing ones) extensions may well be able to be converted to WebExtensions, but the particular extension author will decide that they don't want to do that. Conversely, although Mozilla have stated that the UI (called chrome, somewhat confusingly) APIs are done as much as they want them to be done (policy decision) it's possible that they might do a token exception...or might not. userChrome.css is going for sure and logically, using Mozilla's faux justification for doing so, that would suggest that so will userContent.css. However, I predict that userContent.css (probably renamed to style.css) will actually remain, simply because Chrome based browsers have that and Mozilla is besotted with 'Chrome parity'. In other words, like everything in life, when it comes to anything happening in the future you can only be 100% certain about 90% of a situation. 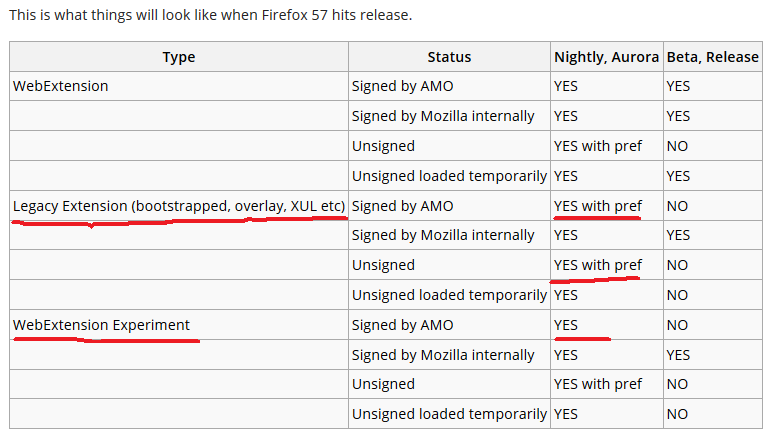 Certainly, it will not be a 'good time' for existing Firefox users who currently use extensions and themes. If you come across Firefox users who tell you different, my tip is to ask them first what extensions and themes that they currently use. In my experience, they'll either vanish or admit that they use almost none or already know that 'their ones' will be converted to WebExtensions. It is a frailty of the human condition to be dismissive of the concerns of others about things that don't affect them personally. So, if you're fresh to this thread and wondering why there seems to be not much going on, it's because you're reading it from the wrong end. Try Page 1 and take it from there.